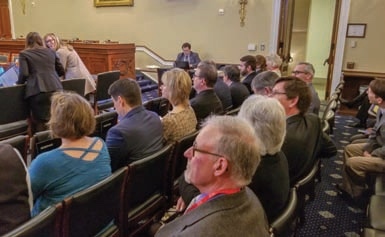 Twenty-four Oregon electric cooperative leaders participated in the National Rural Electric Cooperative Association’s annual Legislative Conference April 10-11. The group met with Oregon’s congressional delegation and key House and Senate committee staff. The following photos tell some of the story of their journey to the nation’s capital. 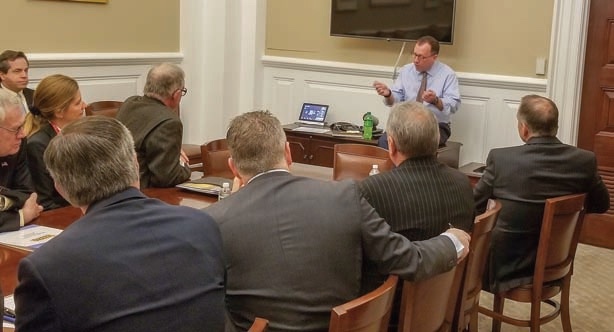 Above, Oregon electric co-op leaders met in Speaker Paul Ryan’s office to thank his energy adviser, Kiel Weaver, for his assistance on vegetation management and hydroelectric issues. 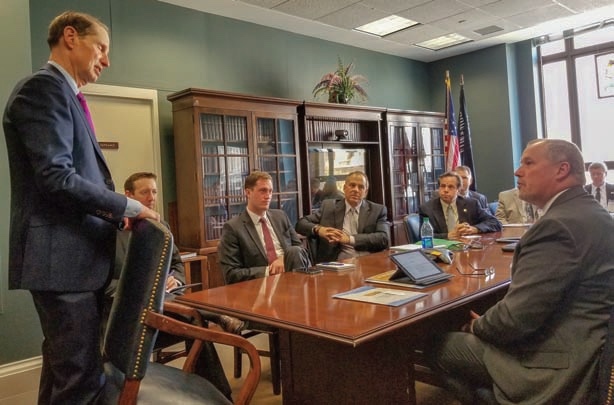 Below, Midstate Electric CEO Dave Schneider, far right, briefs Sen. Ron Wyden about the impacts of cuts to low-income assistance programs. Wyden pledged to oppose reductions in low-income assistance and expressed strong opposition to privatization of the Bonneville Power Administration’s transmission assets.